While 1.6 billion pounds of shrimp is consumed annually in the United States, 80 percent of its supply is imported. Balaton-based trū Shrimp is looking to change that by growing healthy shrimp in southwestern Minnesota, and it is researching corn as its main food source. 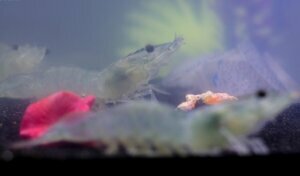 The Minnesota Corn Growers Association, under the direction of the Minnesota Corn Research & Promotion Council, is working with trū Shrimp researchers to explore corn as a cost-efficient and nutritious feed for its growing shrimp. 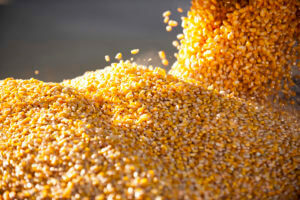 By investing in the Minnesota corn check-off, our state’s corn farmers are setting the stage for profitability. While low commodity prices are a point of stress, allocating resources to improving the areas we can control is more important than ever. Over the coming weeks, we will be highlighting how your investment is doing just that. You can read the series to date here. 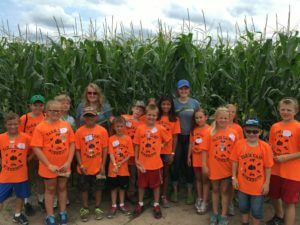 Farm Camp Minnesota returns this summer for its seventh year, and registration is now open for children in grades three-six who are interested in attending the fun and educational day camp. 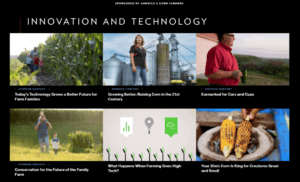 The National Corn Growers Association (NCGA) partnered with National Geographic this fall to share the stories of America’s corn farmers with a robust national audience. Four farmers, including Minnesota’s Bryan Biegler, were visited by the magazine over the summer, and their stories will be told on NationalGeographic.com and its social channels through November. The campaign features four articles, each of which profile one farmer detailing the impact of innovation and technology on corn farming. 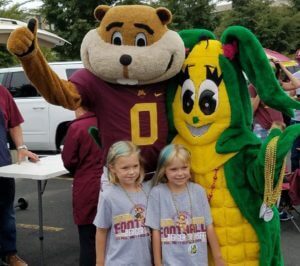 Minnesota agriculture took center stage at TCF Bank Stadium on Saturday during the 5th Annual Ag & Food Day, as the University of Minnesota Golden Gophers took on the Middle Tennessee State Blue Raiders. The more than 43,000 in attendance were treated to a convincing Gopher victory while learning about the work of Minnesota’s farmers. Prior to the game, ag companies and commodity groups filled Oak Street in front of the stadium with takeaway items and information about the various sectors that make up Minnesota agriculture. Minnesota has been a popular summer destination for countries interested in developing new trade partners for grain. 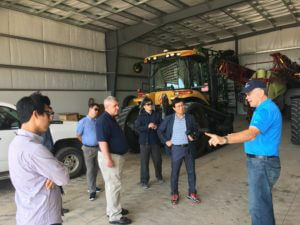 Last week, six corn purchase committee leaders from South Korea made their way through southern Minnesota corn operations, including farms, a grain inspection facility and a co-op. 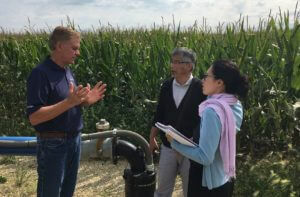 Representing the Japanese Ministry of Agriculture, Forestry and Fisheries, Kimihiko Eura visited Minnesota last week with a full agenda, experiencing nearly every corner of Minnesota agriculture. USDA offices, co-ops, ethanol plants, and of course many farms were all included during his week-long stay. 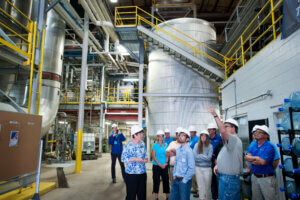 Organized by the Minnesota Corn Growers Association (MCGA), Eura’s trip to Minnesota was planned with the objective to gauge crop conditions, supply and demand of Minnesota corn and its storage capabilities. 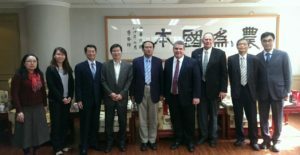 The US grain harvest in 2012, which was smaller than expected, forced loyal customers like Taiwan to look elsewhere for the poultry and hog feed previously provided by U.S. farmers, causing U.S. share of Taiwan’s grain market to drop 40 percent. Not taking the change passively, the U.S. Grains Council developed the Grain Quality Condition report, which informs markets like Taiwan on the quality of U.S.
With a few small changes to improve the nutritional profile of distillers grains, also known as DDGS, research scientists at the University of Minnesota hope to deliver a triple win. Commodity Classic 2017 is well underway this week in San Antonio. The annual event, held March 2-4 this year, is America’s largest farmer-led, farmer-focused convention bringing together the National Corn Growers Association, American Soybean Association, National Association of Wheat Growers, National Sorghum Producers and the Association of Equipment Manufacturers for meetings and more. The show attendance for 2017 is estimated to be at more than 9,000 individuals, with at least 4,000 of those attendees being farmers.